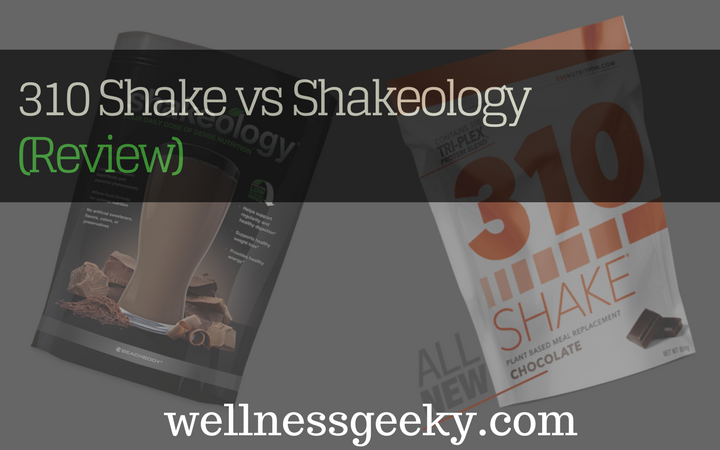 310 Shake vs Shakeology Review (2018): Which is More EFFECTIVE? You are here: Home / Healthy Diet / Health Supplements, Vitamins & Minerals / 310 Shake vs Shakeology Review (2019): Which is More Effective? Does navigating the world of weight loss meal replacement shakes have you scratching your head and throwing up your hands in confusion and frustration? We know that figuring out where to buy the best, most effective shake for you can seem harder than understanding quantum physics. With all the marketing, competing opinions, products, and reviews out there, it's enough to make anyone head for another cylinder of Oreos. In addition to top brands like 310 and Shakeology, there's Isagenix, Idealshape, Beachbody. We've scoured each nutrition label, and tested and researched the top two leading shake brands - 310 and Shakeology - and compared and reviewed them here for you in detail so you don't have to. Read on to find out why the 310 shake comes out ahead and takes our pick as the number one weight loss meal replacement shake. Put this reading behind you, get started today, and you'll be on your way to your actual ideal beach body before you know it. Overview: What is a Meal Replacement Shake? Let's start at the beginning. Many sites dedicated to providing information about these products tend to start in the middle; or worse yet, the end. So, let's take it one step at a time. Both 310 Shake and Shakeology are what's Referred to as a MEAL Replacement. MealRreplacements Most Often Take the Form of a Shake or Smoothie, a Bar, Drink, or sometimes bowl of clear broth or light soup. They are designed to provide you with the necessary nutrients, vitamins, minerals, and calories to supplement a meal comprised of solid food. Doctors, nutritionists, and professional trainers often prescribe meal replacements as a way to stimulate rapid weight loss and cleanse the body. Meal replacements can help give your diet or nutrition plan a jump start, particularly if you have a lot of weight to lose. Often you will start with replacing all three meals a day with a replacement, then, as you lose weight, reduce that to two, and then one, and eventually go back to all solid food when you're ready to maintain your ideal weight. Many people continue with one meal replacement a day for life to maintain their weight and ensure they’re getting the requisite amount of vitamins, fiber, and minerals. One serving of 310 is 90 calories, whereas a single serving of Shakeology contains 130 calories. While this alone is already enough to put 310 ahead in the ranks, let's take a look at where those calories come from. Calories can be deceiving, especially when a product touts a very low amount per serving. It's important to understand where those calories are derived because sometimes the source can reveal hidden fats, high sugar content, or other ingredients that are bad for you and detrimental to weight loss. A 310 contains one gram of fat per serving and a Shakeology shake contains 2 grams of fat. While that might not seem too terribly significant, the Shakeology shake has double the amount of fat per serving. If you don't have a lot of weight to lose, this can be a negligible amount, but if you want to lose a lot of weight, this can add up quickly. It might be only three grams a fat per day, but that adds up to 21 grams per week, and 84 per month. That's a lot of fat. If you're drinking the shakes for months, it's wise to do the math. The 310 is much more beneficial when you consider the amount of fat per serving you're drinking. Another important ingredient to look at when you're considering overall calories is sugar. Hidden sugars can be a real belly-buster when it comes to losing weight and keeping it off. Shakeology contains seven grams of sugar per serving, and 310 contains zero grams. That's right. 310 is 100 percent sugar free. Carbohydrates require more vigorous exercise in order to burn off during exercise. Our bodies convert carbohydrates into stored energy, so you need to ramp up the intensity of your workout to burn carbs, as our bodies like to hold on to this energy. A Shakeology shake contains 14 grams of carbohydrates per serving and a 310 contains 7 grams. Once again, the 310 comes in with half as many carbohydrates per single serving against Shakeology, and those carbohydrates add up. The fewer stored carbohydrates you have, the harder you'll have to work to burn those calories. One of the most important aspects of our diet is protein. While almost on par with another, Shakeology has one more gram of protein than 310--16 grams per serving as opposed to 15. These might seem close enough (for government work, anyway), or even put Shakeology ahead on this one, but not so when you take a closer look at the type of protein. 310 contains their special proprietary blend of protein called tri-plex. This is a blend of three plant based proteins that work together to tackle weight loss in a way that isn't matched in Shakeology or any other meal supplement. The tri-plex blend contains a mixture of brown rice, pea, and hemp protein. Hemp is high in fiber which leaves you feeling fuller longer and aids in digestion and overall intestinal health. Hemp also is mainly comprised of protein, which is harder to burn, so it raises your metabolism. Brown rice protein is very low in calories and fat so it's excellent for weight loss. Brown rice also reduces spikes in blood sugar due to its low glycemic index. Pea protein reduces cravings, aids in building muscle, and helps burn belly fat quicker than other proteins. Fiber is essential for weight loss. A diet high in fiber is good for fighting heart health and diabetes, it keeps weight low, and it's been proven to stave off some forms of cancer. Shakeology contains 3 grams of fiber per serving and 310 contains 5 grams. As we all know very well by now, it's critical to good health that we keep our cholesterol low. High cholesterol can lead to hardening of the arteries, which increases your risk of heart attack, stroke, and other types of coronary artery disease. Extra weight can often lead to high cholesterol, so it can be a vicious cycle. A Shakeology shake contains 5 milligrams of cholesterol and 310 contains zero. Another in a long line of positives when it comes to nutritional and health aspects, the 310 comes out ahead yet again. 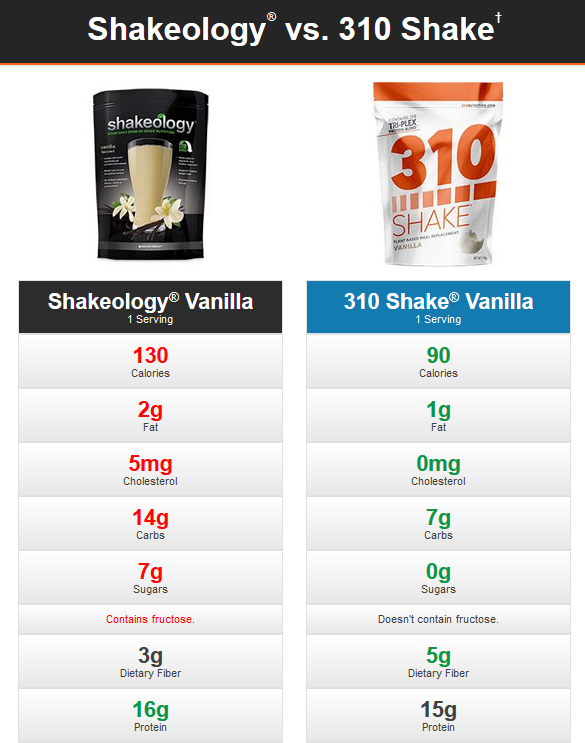 It's easy to see when comparing them side by side in a 310 versus Shakeology competition, 310 is the clear winner. The 310 ingredients list is lower in all of the important factors when trying to lose weight and higher in those that help you maintain better overall health and wellness. And just to put the proverbial nail in the coffin, 310 Shake contains a superfood greens blend to their already high nutrient amount. It contains spinach, kale, organic broccoli, cracked cell chlorella, spirulina, alfalfa juice powder, pomegranate extract, and beet juice. They're also high in probiotics, which are excellent natural antibiotics and help to improve gut health. 310 Shake is also soy, gluten, and dairy-free, and they contain no chemicals or artificial ingredients. You can pick up the 310 starter kit for under a hundred dollars, and it contains everything you need to crush your weight loss goals--shake mix, a shaker, and a metabolism-boosting supplement. All told, it's 310 Shake is a winner in my book.